The second big expansion to Sid Meier's Civilization VI. The Gathering Storm add-on enriches the production with a number of aspects related to climate and geology. This is Sid Meier's Civilization VI expansion pack. 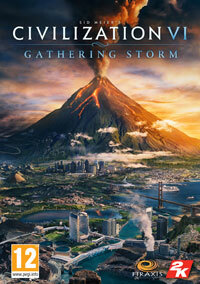 Gathering Storm is the title of the second major expansion to Sid Meier's Civilization VI - a turn-based 4X strategy from 2016. Just like the basic version of this production, the add-on was developed by Firaxis Games studio. Sid Meier's Civilization VI: Gathering Storm enriches the game mainly with a number of aspects related to climate and geology. The changes taking place all over the world reflect the choices made by the rulers of individual states, and their actions are influenced by such phenomena as snow blizzards, sandstorms, hurricanes and tornadoes, as well as volcanic eruptions and floods (which are the aftermath of rising water levels in the seas and oceans, which in turn is the result of melting ice caps). Raw materials and topography also play an important role. Although coal or oil allows for the initially efficient functioning of society, renewable energy sources are becoming more and more important over time. In addition, when choosing a location it is worth taking into account the potential opportunities and threats lurking in a given location - however, the matter is facilitated by the possibility of sculpting the landscape, for example by building dams or tunnels. A separate issue is the World Congress - by speaking at it, we influence the fate of the whole world, as well as gaining potential allies and influence. In addition, by taking part in special sessions, voting on resolutions or using allied favours, we score points to achieve Diplomatic Victory. Expansion also introduces a new era (21st century), eight civilisations and nine previously unavailable leaders. The list of novelties also includes additional units, buildings, districts and technologies, as well as wonders of the world and nature. The authors also introduced a number of minor improvements and bonuses, such as updating scientific and cultural victories, expanding the espionage system or enriching the game with new Historical Moments. Sid Meier's Civilization VI: Gathering Storm introduces two new scenarios. Players who prefer to play alone can test The Black Death mission, which takes place in 14th-century Europe and Western Asia, where the title Black Death rages. Their task here is to lead their civilisation through this difficult historical period. The second scenario is a multiplayer War Machine, which was set on the eve of the First World War. The German army intended to attack a neutral Belgium and France before these countries could mobilise their forces to resist them. Gathering Storm is not an independent add-on and requires a basic version of the game to work. Game score 7.71 / 10 calculated out of 49 players' votes. Expectations before the premiere: 7.5 / 10 calculated out of 41 players' votes.